When it comes to markets, I'm pretty much like a fat kid and cake..I just can't seem to stay away. 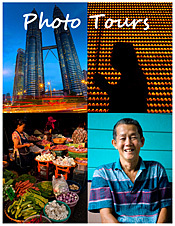 I recently had (admittedly) a dream corporate assignment to shoot several markets in south east Asia. One image that I kept back found it's way to a double page spread in this month's Saveur (pick up a copy and check out Robyn Eckhardt's write up on markets in Thailand, Lao, Indonesia, and Vietnam). The photos above (as well as the Saveur shot) were taken in Chiang Mai's Myung Mai market. This is probably my favorite market in the region. It's a sprawling complex of wholesale and retail stalls that at the right time of year (Jan-Mch) between 7:15am and 7:45am has a great 'corridor' of light that just makes everything pop out. I first experienced this market (and the morning light) about 5 years. At that time the location where the pics above were taken was a newly contructed but yet un-occupied shop house. I slipped upstairs early one morning and shot 3-4 rolls of film before the merchants below raised their umbrellas and changed the whole scene. When I got the corporate assignment I lobbied for Myung Mai with just that early morning shot from above in mind. But then sometimes things don't always go as planned. On my first morning in Myung Mai I noticed that the shop where I needed to be was now occupied. Of course I thought it would be no problem, chat the owner up and he'll be more than happy to let me up on his balcony for those precious 30 minutes. WRONG -I get the great big 'NO'. In fact, not even a 'no' but a I don't care if the door knob hit's your fanny on the way out 'no'. So I figure - he just needs to 'warm' to me, see me a few days..then ask again. Day 2 - does she know something I don't? And what about these guys..? Turning their backs on me? But hey, I'm not giving up. I show up at the shop again..not even up the second step when the owner shakes his head 'no'..okey, dokey..
OK, now I'm starting to panic. I don't have forever to finish this assignment and want that shot. I shot some details, but I'm thinking that ain't gonna cut it with my clients. I need help. I need an intermediary. I need a miracle. So I recruit the daughter of a close friend. Smart, attractive, polite - game over I'm thinking. Together we stop by the shop one afternoon. The owners son is there and once we explain what we are doing says it'll be OK, but first let him check with his father. We exchange numbers and wait for the good news. It doesn't come..or more accurately..we get the big 'no' again. Seems he's concerned that I'll fall off the roof and says there was a 'problem' before. But I think - let's give him a day or two. Day 4 - more general shots, good light, but the smoke had started to move in. We try one more time and it happens -'OK, but you can't go on the roof'..since I didn't want to go up that far anyway that was all I needed to hear. I told them I would be there at 7:00am the next day (with bells on..athough they told me to leave the bells at home). Day of the shoot, thick, thick smoke blankets Chiang Mai. Here's the scene at 7:15am (but from the balcony!).. Long story short, I got the shot. Not exactly what I wanted. I could have used some better light but the shop owner turned out to be a really nice guy. Brought me water, even invited me up to the roof ( I declined -the umbrellas were out by then - you can set your watch by these vendors). So that's as much a part of it as anything in my book. Cupcake - The shot was the easy part. Now I have to get paid ;). Persistance pays off! I have to learn how to be less timid and more "thick-skin" when it comes to taking photos. Nan - Of all the lessons, learning to wait for the moment and getting closer to my subject have been the most important. Keep pushing yourself! All of these are incredible pictures. I am also a huge fan of fresh markets and enjoy letting my mind go crazy looking at all the interesting things. Thanks Mark - There's really no better place to start a trip than in a wet market. It gives you a feel for what's in season but also how people interact. Happy travels.